Regardless of what style or color of furniture or architectural treatments might be in vogue, what has held fast throughout the generations is wood. Depending on how they’re incorporating wood into their home project or remodel, DIYers should educate themselves on what types work best for what tasks. More than 100 years ago, wood veneers were introduced to help conserve hardwoods. Cheaper woods like gum, fruitwood or poplar were used as the core over which mahogany – a less stable wood that absorbs moisture – was often veneered. Higher quality pieces might have had solid red oak as their core. Wood stains were often dark during that period, too. Cherry – a hardwood – has a reddish-brown to blonde color that can darken with age. It’s often affiliated with more traditional pieces, but it goes with the shaker style as well. Walnut – expensive, like cherry – has beautiful color in its natural state. From a chocolate brown center to its yellow outer rings, it’s very popular in a wide variety of furniture construction. It can be transformed into both ornate headboards or rustic fireplace mantels. Those who appreciate wood grain would be fans of oak. Red oak’s grain resembles swirling water while white oak has more of a tiger-stripe. On the cheaper side is pine. It’s still appreciated by those who enjoy a rustic or country look, it takes paint well and is useful in a variety of applications. It is a soft wood, however, so it doesn’t take abuse well. Maple is one of the most durable woods so it’s often used in bedroom furniture and kitchen cabinets. A beautiful cream-color in its natural state, it takes stain well and is long-lasting. It’s also affordable. 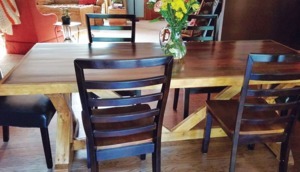 Nowadays, there are craftspeople that make it their mission to find wood furniture, home accents and plain old pieces of wood in the hopes of repurposing them into unique and functional items for clients and the general public to enjoy. 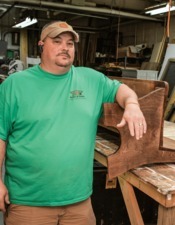 the past two-plus years, he’s been working with wood since he was 18. 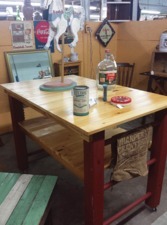 He now combines a workshop with retail space in White Owl Antique Mall in Mt. Pleasant. Having worked in power and fiber-optic utilities for 22 years, Keller built furniture for his wife, Kelly, an interior designer, on a part-time basis. She would design it and he would build it. What they were fortunate to be able to do – and what many people wish they could do – was take that leap and turn a hobby into a full-time business. What Keller feels enabled him in his quest was the recent recession. It brought with it a challenge for designers and homeowners looking to make a change but not having a pre-recession budget. In the world of wood, it pushed both DIYers and professionals to turn to what already existed. It certainly doesn’t mean lesser quality. “In my down time (when he’s not working on a job for a client) I like to antique shop and make furniture from what I buy. I go to auctions about every Friday night…telephone book tables, old desks, chairs. If it’s not wood, I don’t buy it,” Keller says. He transforms his finds into a variety of pieces, mainly rustic or shabby-chic. 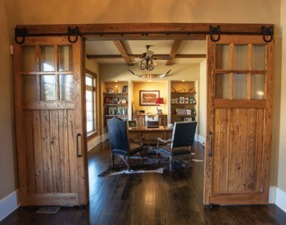 What has become a hot commodity in creating this style is old barn wood. Applications besides furniture can include headboards, accent walls and fireplace mantels. Enter, technology. If you can’t find old wood, products are being introduced to meet the demand and retailers like The Home Depot are offering them. The 28-inch by 11-inch thermo-treated wood wall panel is one, undergoing a process that involves heating new wood to extreme temperatures without oxygen. The treatment creates cell-level chemical changes within the wood that makes it appear aged. “Wood is a natural material; each board will vary in color, shade and the way of cracking, which provide you with a wall deco´r that is truly a unique work of art,” homedepot.com says. Another product is a distressed white wood panel. These five-inch by 47-inch panels are prefinished with water-based paint and coatings. There’s also the hardwood wall strip. Pre-engineered two-ply white oak strips are butted together, have square edges and varying depths. Installation requires nails, glue or staples and the product comes in a wide variety of stain shades. In conjunction, the four-inch by 24-inch solid hardwood wall plank is constructed of white pine or oak and stained in a weathered gray, medium color or rustic finish. It’s installed with glue. All of these products are on the pricey side. He and Kelly have also delved into distressing wood, creating an aged, weathered look from a newer or refinished piece of furniture. Keller doesn’t see this style as a passing fad. “People are looking more at the simple life; we’ve got every walk of life as customers. I think it’s a positive because you’re repurposing instead of throwing away. A lot of folks go to (big-box stores) and it’s all pressboard. It’s made to replace, not to repair,” he says.